Battery is source of portable power. It is a container that consists of one or more cells where the chemical energy is converted into electrical energy. Thus converted energy is later on used as a source of power. The chemical reactions in the cell create the flow of electron in the circuit. A battery is basically an enclosed electrochemical cell that can provide static power once it is electrically charged with. There 3 parts in a battery: anode (-), cathode (+) and the electrolyte. It basically accumulates electric power and stores a specific amount of energy which can be used later on. Vacker KSA supplies Battery Charging Systems in Riyadh, Al Khobar, Dammam, Jeddah, etc. 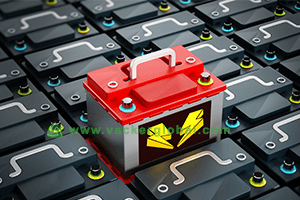 What is a Battery Charging System? Batteries and their charging systems should never be a matter of trouble for you or your industry. Yet it has been witnessed that these issues have been troubling most of the industries all over the world. We should set priority and pay attention on improving the life of batteries and enhancing the overall battery charging system. 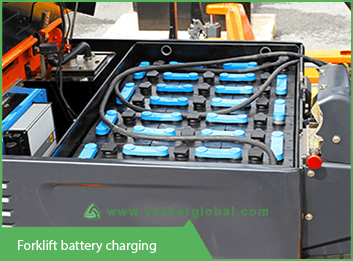 The basic battery charging system consists of 3 parts: the alternator, the voltage regulator and the interconnecting wires. These 3 integral parts composite the charging system and this has not changed much over a very long time. The core purpose of the charging system is to sustain charge in the battery and to provide a stable energy so that the charge drained is charged back again after or during use. It is obvious that the charge of the battery depletes whether or not in use. If the battery is in use then the rate of depletion of charge is faster in comparison to when the battery is not in use. If any of the parts of the charging system stop working then the charging system is left incomplete and hence the battery cannot be charged. As a result of which, the charge of the battery will only deplete until the battery goes dead. In case of vehicles, if the battery has low charge and the alternator is not working properly then the vehicle’s engine will not have sufficient electrical current supply in order to ignite the spark plugs resulting in failure in working of the engine. If there is a problem in the charging system and the charging process has been affected then the battery slowly drain to nil charge. But if your battery is drained then it does not necessarily mean that the battery is useless. It is just that there is no charge in the battery however it can be charged again and used again. The alternator is the main component of the battery charging system and is the generator of the system that produces AC current, which is immediately converted into DC current within the alternator. It is done so because in modern days vehicles use 12 volt DC electrical system. The voltage regulator, which is generally enclosed within the alternator, regulates the voltage used for charging that is produced by the alternator. The voltage is kept between 13.5 volts to 14.5 volts so as to protect all the electric components of the vehicle. This system is completed with the connecting wires. In general, there are 3 sets of wires with a number of loops completing a 3 phase system. In some of the battery charging system, there are wires that are interconnected to each other at one end while at the other end they are connected to a rectifier assembly. These wires are highly conductive in nature and acts like the blood vessels of the human body that carries blood to and from heart to all over the body. Sometimes you may face problems with your battery charging system. Not all of us are experts in figuring out what exactly has gone wrong. With a little guidance from Vacker KSA, you might be able to help yourself out in such situations of difficulties. Despite being very careful, a number of things might go wrong and here are some of few reasons why. You should always disconnect the battery prior to replacing an alternator, if it needs to be replaced. 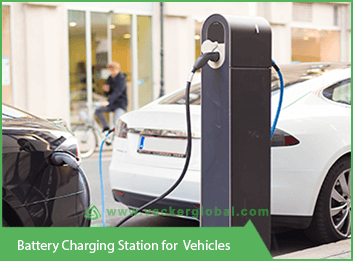 With Vacker KSA offering services and products in Dammam, Riyadh, Al Khobar, Jeddah, etc., your batteries and the entire charging system may just work longer and fine than the usual.